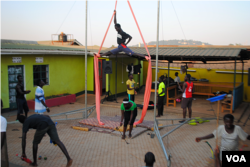 A youth-oriented circus troupe in Uganda is using acrobatics to bring entertainment and education to some of Uganda's most destitute locations. The only program of its kind, the Hiccup Circus regularly visits the most vulnerable in Ugandan society, bringing good cheer while spreading important information about health and safety. Just outside one of Kampala's major slums, a teenager practices his fire spitting technique. The trick, the instructor tells him, is to purse his lips. Not far away, a juggler is practicing with tennis balls as a young woman climbs into the air to practice her aerial acrobatic routine. Its just another day for Uganda's Hiccup Circus, a youth oriented circus that aims to both educate and amaze. 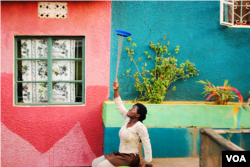 The brainchild of founder Giacomo Babaglioni, Hiccup Circus tries to focus on the most vulnerable in Ugandan society. For this reason they have performed at schools within juvenile detention centers, slums and refugee camps. "Why we target mainly schools, there are several reasons. First of all, the children are already there so we don't have to mobilize...second even if we take smiles and entertainment and fun and these kind of things, schools remain in an educational setting. So together with the entertainment we can spread the message about the education. This is the main philosophy we have," said Babaglioni. Their upcoming performance, at the Kiryandongo Refugee Settlement, which houses over 3,000 refugees mainly from the Democratic Republic of Congo and South Sudan, will focus on immunizations and AIDS awareness. To prepare for the event, a professional clown therapist visiting from Italy teaches the youths how to commit to a bit through the art of silly walks. Babaglioni says the circus creates an innate sense of pride in those that have little opportunities elsewhere. With a high unemployment rate in Uganda, and rising issues with idle youth, it is an excellent way to keep young adults focused on a goal. Sponsorship from various organizations also means the circus performers are paid for many of their shows. One of the performers, 19 year old Grace Amajong, says the circus gives her and her community a sense of purpose. "Circus is all about we go out into society and pass out information socially and then as well as entertain. Like we entertain them but at the same time we are educating them. I like to bring the information out because I'm trying to help people out there, and I feel good when somebody takes my information and then something is done about it. That makes me so happy. It's going to do something that is positive, it's going to be a positive change towards the community and the society," says Amajong. The Hiccup Circus, which has partnered with the Kampala Capital City Authority and the Ministry of Health and Education, hopes that in the following years their core group of well trained acrobats can in turn train younger children and expand the troupe and bring entertainment and education to some of Uganda's most destitute locations.